With the leaves changing and some Upper West Side cabin fever setting in, my friend Kate and I ventured up to Blue Hill at Stone Barns in Tarrytown, NY to check out the farm and grab a delicious lunch. Kate and I once had an epic road trip from Montana to Connecticut-3,000 miles of National Parks, too much eating at Subway, and falling in love with the undulating fields of Iowa- but now we’re lucky if we can drive 30 minutes north with our two infant girls. In fact, my email last week to Kate was titled “Road Trip (not the kind we used to go on).” Though not as famed as the official restaurant on the property (what a place for an event! ), the Cafe serves up lots of fresh produce from the 80 acre farm, as well as sandwiches, hot tea, scones, and other deliciousness. For those of you New Yorkers, they also have a great tiny restaurant in the Village for a fancy night out. We also shopped around their farmers market, where I snapped away at the gorgeous colors of deep purple beets and fresh wildflowers, and explored some of the verdant greenhouses. Eventually, we held a portrait shoot with Kate and her daughter Eleanor. Kate was a great sport- tossing E up in the air again and again to get that perfect laugh in mid-air. Eleanor, only one day shy of her 1/2 birthday, was really hamming it up for the camera. I just love capturing these mom/daughter moments- I think too often the moms are the ones behind the camera- and life goes by too quickly to miss recording these proud smiles, funny expressions, and serious love! Here are a few of my favorite snaps. What is your favorite fall day trip or getaway? Kathy and Kevin picked the perfect date to marry- 9.10.11! Two weeks after Hurricane Irene blew through the Tri-State area, her mark remained with downed trees, flooding, and massive power outages in the state of New Jersey. The bride and groom had their own whirlwind week leading up the wedding. They moved their family of six into a new house (the site of the wedding), which was under a strict construction deadline. Despite the power outages, the landscapers and construction crew worked wonders and transformed the property in the nick of time. Kevin and Kathy’s new home is located just off of a gorgeous winding country road. 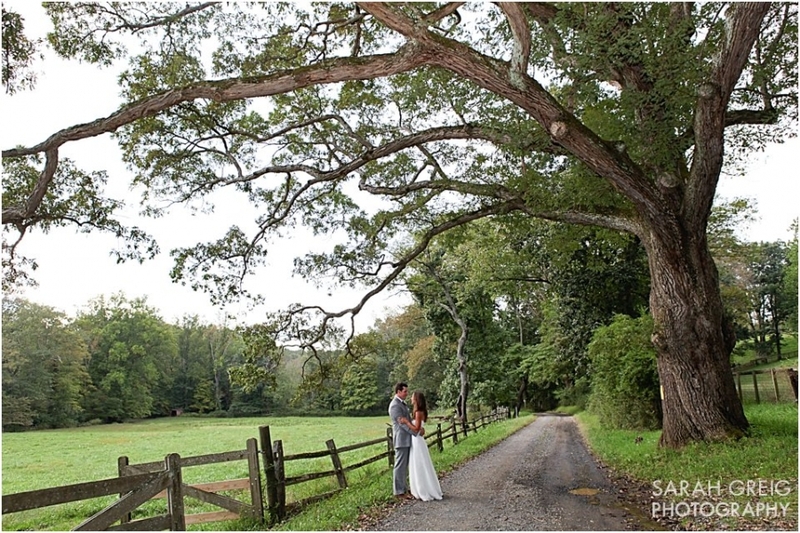 Complete with weathered fences, lush green fields, and ancient trees that gently bend over dirt roads, the setting is what photographers dream of! Their outdoor ceremony was filled with sweet moments like Kathy’s son walking her down the aisle, some tears during the vows, and their two Labrador retrievers wandering in and out of the ceremony and reception. Following the ceremony, I whisked the newlyweds down the road to catch the afternoon light and shoot couple portraits under a stunning old tree. We also captured a few shots on their new front porch—symbolic of many new beginnings for the couple. The wedding included beautiful reminders of the beginning of autumn, with hay bale lined walkways, rustic wooden chairs, and rainbows of mums. The reception was a blast to photograph- especially when the groomsmen used their ties to create a limbo contest! How can you go wrong when the evening ends with lots of dancing, delicious cupcakes, and homemade s’mores? Special thanks to my second shooter for the day, Suzie St.Pierre, who captured many fabulous moments and details. Congrats Kevin and Kathy- it was a pleasure to work with you and your amazing families. © 2019 Sarah Greig Photography|ProPhoto Photography Blog by NetRivet, Inc.